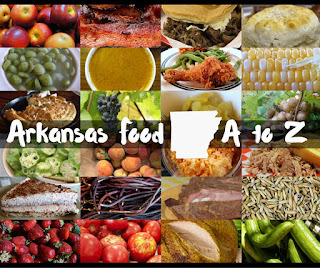 Each year, the folks at the Arkansas State Fair issue a list of what's available at the Arkansas State Fair. This list is based on what vendors send in and what's been on the menu at previous fairs. It's usually pretty close to accurate, but some changes happen here and there and I try to make sure to share that information. 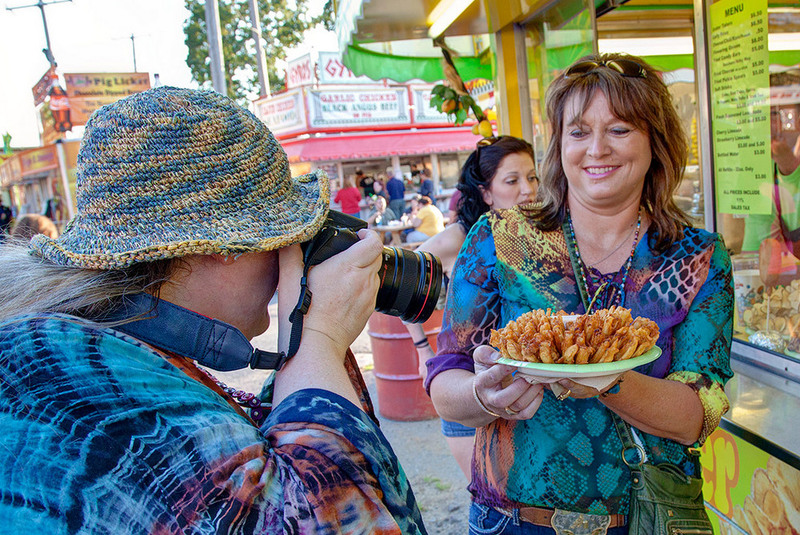 After all, these once-a-year treats tend to be multi-dollar items, so might as well know what's out on the midway before heading to the fair to get the best bang for your buck. 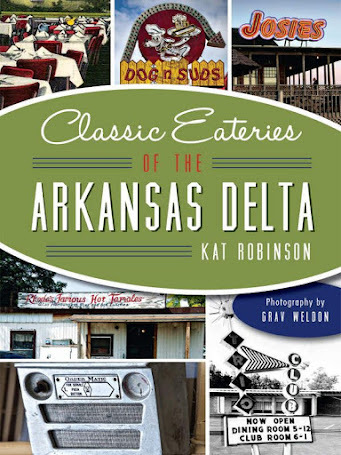 And just because it's new to the Arkansas State Fair, doesn't mean it's an entirely new menu item. 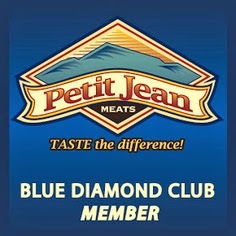 Sometimes we get those, like last year's Big Dog from Petit Jean Meats. 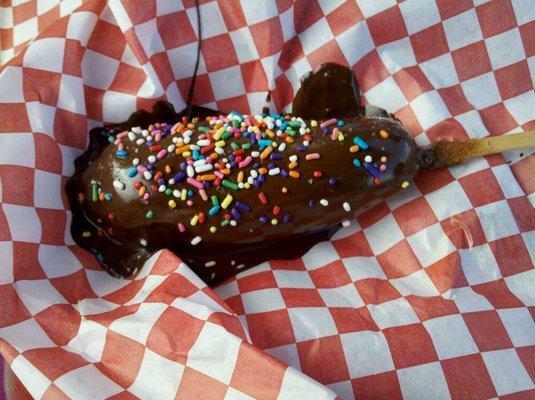 Chocolate dipped corn dog. Combining deep fried traditions with chocolate, this is exactly what it says it is, in all its questionable glory. The item first cropped up at the San Diego County Fair in June 2011. I'm surprised it's finally arrived here in Arkansas. The original image here first appeared on Yelp for that fair thanks to contributor Jake R.
Maple bacon corn dog. This one's questionable as far as a new item. No one's done the exact menu name here, but Iowa introduced the Double Bacon corn dog in 2012. You can make this menu item, thanks to it being featured on The Chew last year. I'm interested to see if it looks the same, and who's offering it. Cinnabon Stix. New to the Arkansas State Fair but certainly not to Cinnabon customers, these are a cross between breadsticks and cinnamon rolls. Easy dipping ahead. Maple bacon funnel cake. First introduced at the 2013 Three Rivers Festival in Fort Wayne, Indiana, by Momma Jane Harris, this is a traditional funnel cake topped with maple buttercream, powdered sugar and real bacon bits. It's hefty. Snickers bar salad. 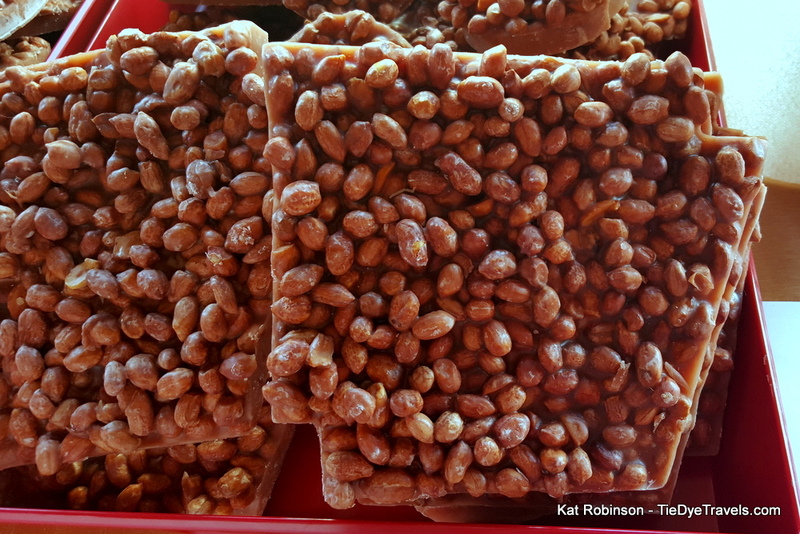 This one's from the 2015 Minnesota State Fair, and it is rather unusual for a state fair food, at least what we're used to. 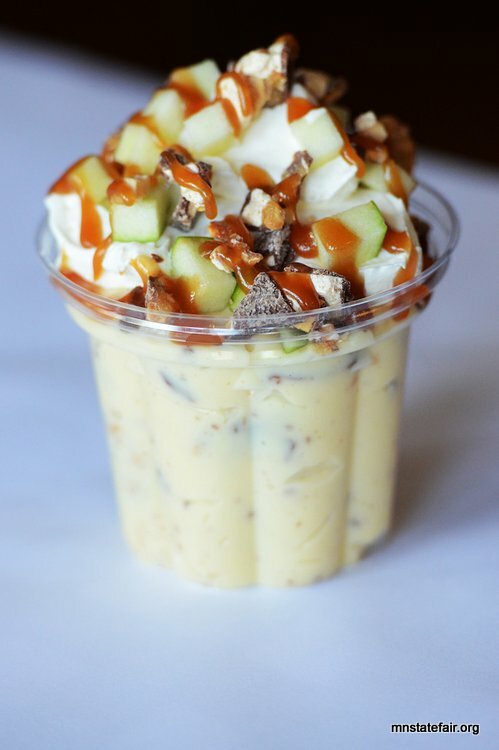 There are no deep fried or bacon components here - just chopped Granny Smith apples and Snickers bar pieces tossed in vanilla pudding with whipped cream and caramel sauce. Pretzel crusted brownie on a stick. Introduced at the 2015 Wisconsin State Fair, this is one fair dessert that makes sense - a brownie that's first deep fried, then covered in caramel, then rolled in pretzel bits. I'm looking forward to trying this one. 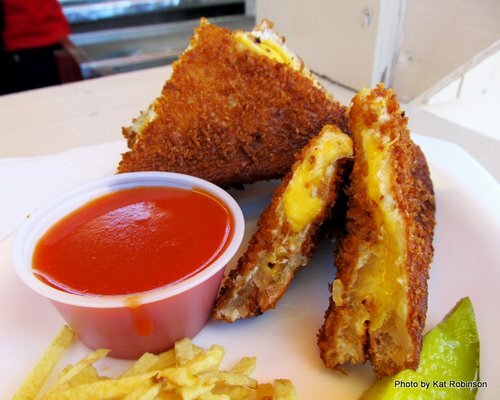 Fried grilled cheese sandwich. 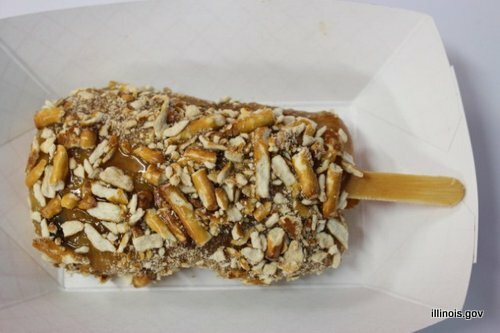 I first encountered this one at the 2011 State Fair of Texas. As far as fried foods go, this is a great idea, simple with excellent execution. Fried chicken and gravy in a bread cone. Jamaican sausage in a cone. Chicken pot pie in a cone. The idea of bread in a cone is not new. 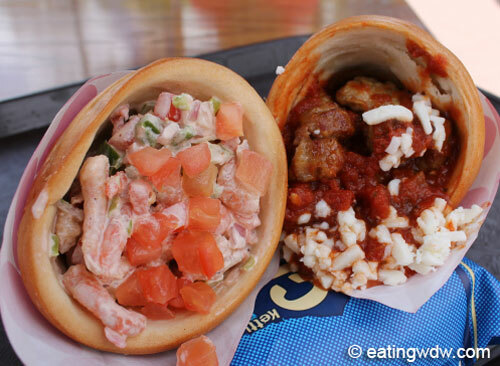 The Las Vegas outfit Conewich has been around for more than two decades. However, cones filled with crazy things seem to have really taken off with the introduction of the mac and cheese filled cone at Disney World in 2014. This year at the Minnesota State Fair, cones took off, so expect to see a lot of cone-delivered items. Not to be confused with the Pizza Cone, which debuted at the New York State Fair in 2014. Chicken enchilada parfait. 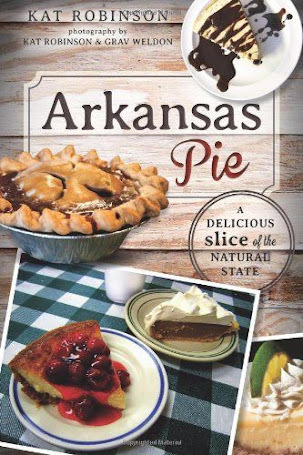 This may be it - the actual new item for the Arkansas State Fair this year. I've heard about barbecue parfaits, mashed potato parfait and even roast beef parfaits, but this one may take the cake. Peanut patties. Not a new item! In fact, Elve's peanut patties go back decades. The company came to the Arkansas State Fair for the first time last year, but they've been a fixture at the Four States Fair in Texarkana for generations. Read about their story here. 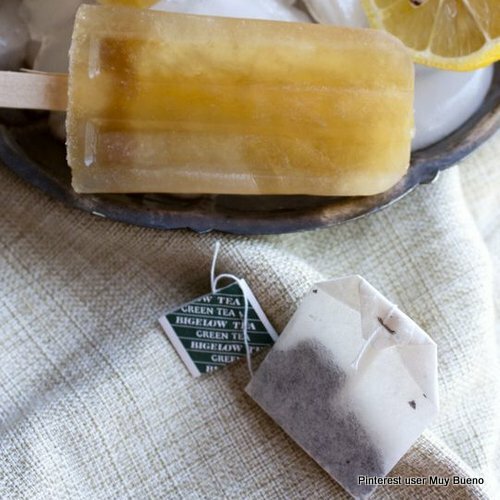 Sweet tea on a stick. Please, please, please let these be lovely sweet tea popsicles, and not another strange dough-and-beverage conglomeration such as fried Coke. I declared the era of frying beverages over last year, and I don't think there's a real calling for bringing these back. However, if we're talking popsicles, BRING THEM ALL TO ME. Bacon wrapped Jo Jo potatoes. New last year to the Arkansas State Fair, these are bacon-cheese-fries without the cheese. Each thick potato wedge is wrapped in a single strip of bacon before being fried. Yes, you can get it with cheese sauce. Mexican pastry churro. I'm pretty sure these are locally made from one of our local food trucks, but even if it's not, the State Fair of Texas has been serving these for years. 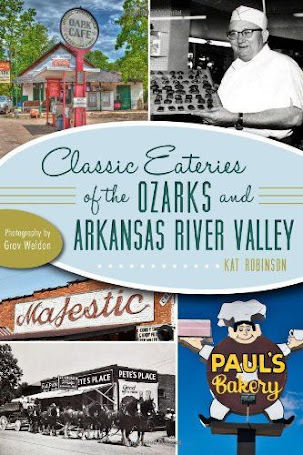 Keep an eye on Twitter and Instagram today between 11 a.m. and 1 p.m., as Grav and I share all the delights that will be disclosed and shared at the State Fair Media Day. And come back for your Tie Dye Travels Official Arkansas State Fair Food Guide.